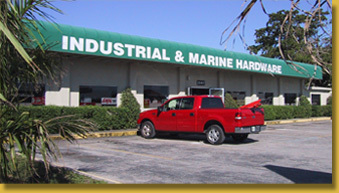 For more than 35 years, INDUSTRIAL & MARINE HARDWARE has been serving Southwest Florida contractors, retailers, and individual consumers. Our product line includes a full line of fasteners, power and hand tools, plumbing and electrical supplies, mobile home supplies, and much more. Specializing in hard-to-find items, our knowledgeable sales staff are experts in tracking down unusual and obscure hardware. If it's made, we can find it. We're open to the public for browsing our large inventory. We're also happy to take orders over the phone and ship items from our in-store UPS station. Store charge accounts are available for those who qualify.